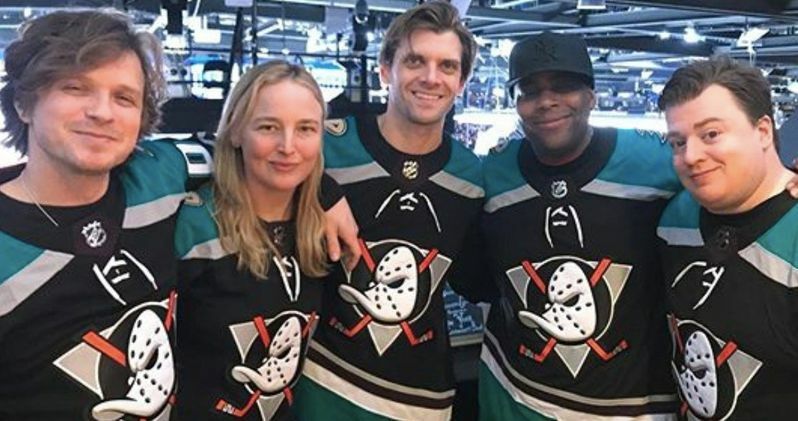 Several cast members from The Mighty Ducks franchise reunited at a recent Anaheim Ducks hockey game. It's been more than 20 years since we last saw the scrappy, fictitious young hockey team on the ice, but for many of those who grew up on Disney movies in the 90s, these remain a nostalgic staple. As such, it should delight quite a few out there to see Kenan Thompson, Danny Tamberelli, Garette Ratliff Henson, Vincent LaRusso and Colombe Jacobsen-Derstine back together again. The official Instagram account for the Anaheim Ducks shared a photo of them gathered together with the following caption. "The quack attack is back, Jack! Glad to have a few Mighty Ducks join us for the game, and a few other fun projects, today on Long Island." Garette Ratliff Henson, Vincent LaRusso and Danny Tamberelli all starred in the original 1992 movie, with both Kenan Thompson and Colombe Jacobsen-Derstine joining up for both of the sequels, D2: The Mighty Ducks and D3: The Mighty Ducks, which were released in 1994 and 1996, respectively. They all appeared at the arena in New York with jerseys that featured their character names, with Tamberelli as Tommy Duncan, Ratliff Henson as Guy Germaine, Jacobsen-Derstine as Julie "The Cat" Gaffney" and LaRusso as Adam Banks. Tamberelli took to Instagram to share his excitement for the experience. "What a sweet day!! Thanks to the Anaheim Ducks for a great day reliving my #mightyducks season with some old friends." While 90s kids are surely happy to see the cast reunited in several photos, many would probably prefer to see them back together on screen. Could that be possible? There has been some talk of The Mighty Ducks 4 possibly happening over the years, with The Goldbergs creator Adam F. Goldberg revealing in 2015 that he pitched the idea to Disney at one point. And the cast is receptive to the idea. In a 2014 interview with Time, Carsten Norgaard, who played Wolf "The Dentist" Stansson, revealed that he's got his gear ready and would be happy to take the call. "Over the years, I've heard rumors of it. And it's kind of interesting, with the impact that it has had on so many kids, that a fourth hasn't been made, or a TV series hasn't been made of it. But it's a good trilogy as it is. But other than rumors, I don't know any more about it. I can tell you that when I left the Ducks, I got all my gear and my skates and everything in a big, beautiful ice hockey bag, and it still sits in one of my closets ready to go." While a big screen revival may not be on the horizon, it was revealed last year that a TV series based on The Mighty Ducks is in the works for the upcoming Disney+ streaming service. So at least we've got that to look forward to in the hopefully not-too-distant future. Be sure to check out the reunion photo below from the Anaheim Ducks Instagram account. Will Mighty Ducks 4 Ever Happen?